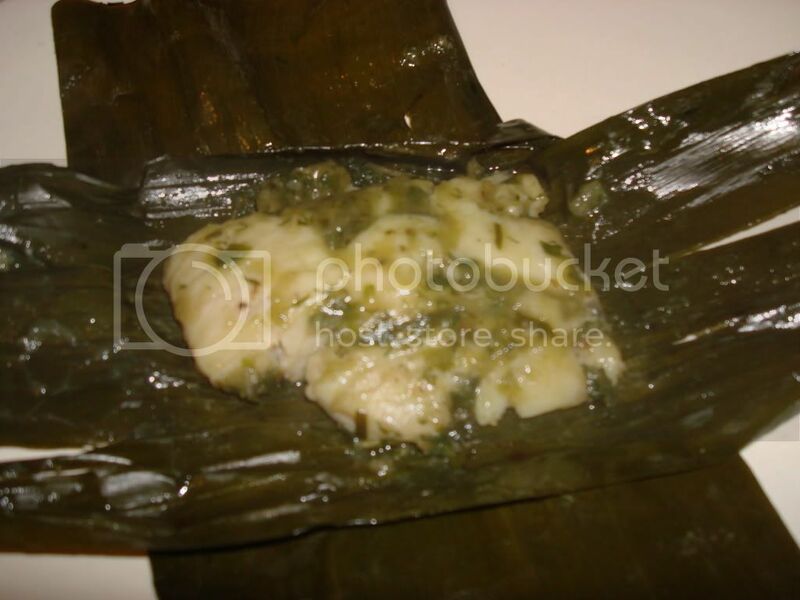 Mok Pa - Lao style Fish Steamed in Banana Leaves - mmm-yoso!!! I hope you don't mind.....a recipe on a Monday. Here's one that I learned during the cooking class offered by Joy of Tamarind Restaurant in Luang Prabang. Sounds much like, Cambodian Fish Amok, but Mok Pa uses no coconut milk. There's also a recipe for this dish in the legendary cookbook, Traditional Recipes of Laos a translation of the contents of 2 notebooks hand written by Phia Sing, the Royal Chef, who resided in the Royal Palace in Luang Prabang. How this legacy of Royal Lao/Luang Prabang style cooking was saved, by the late Alan Davidson, the editor of the Oxford Companion to Food is, of itself, worth of many a post. Perhaps one day I'll take a stab at it. 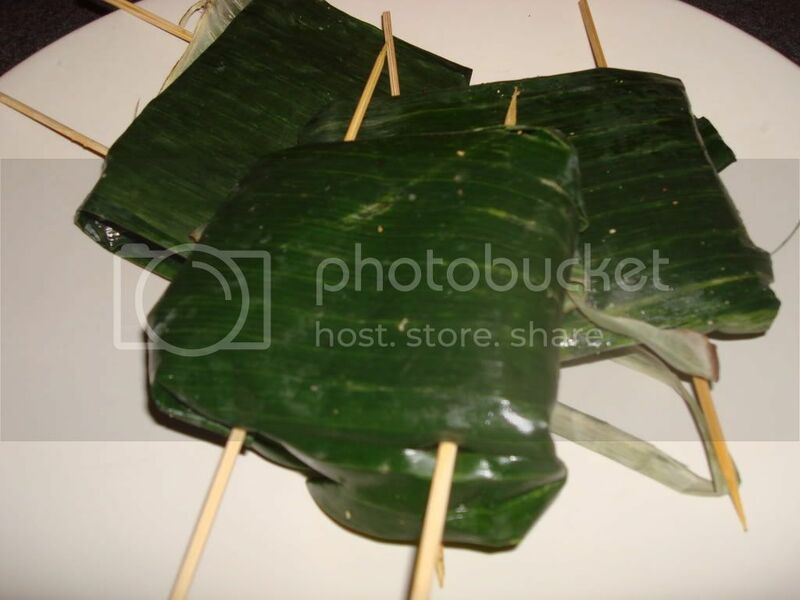 I did notice that items steamed in Banana Leaf is called "Mawk" in Traditional Recipes of Laos, while items "grilled" in Banana Leaves are called "Mok". Here, in deference to the cooking class I took, I'll call it "Mok". I apologize in advance; I'm sure if I worked a bit more at it, I could make this more photogenic. The version I made in Luang Prabang was more a bit more attractive. We basically ate what we made in class, everything was cooked on a charcoal brazier, called a Tao-Lo. I was amazed at how good this came out. When the Missus ate a version of this, She told me, "there's something here that tastes so familiar, but I can't place it". It was the dill. Phia Sing's recipes for Mawk doesn't include dill, but Tamarind's recipe does. I did enjoy the nice palate cleansing, refreshing flavor dill added to the dish. One more key note that was emphasized during the class, "make everything to your taste".....which is what I did, and so should you! 4-8 Banana Leaf pieces, each about 8"x8"
1 - In a mortar combine 1TB salt, garlic, shallots, chilies, kaffir lime leaves, and pound into a paste. 2 - Add Dill, Basil, and Scallions, and incorporate into paste. 3 - Add 2 Tb fish sauce, and 2 Tb water, and mix into paste. Taste and adjust flavors. 4 - Add fish and combine with paste. 5 - Run banana leaves over a flame to make pliable. 6 - Divide up fish into 4 portions. 7 - You can either place 2 banana leaves over each other at right angles, place fish in the middle, and pour on some of the paste. OR if you're like me, and all thumbs, just fold the darn thing up, sealing well. 8 - Seal and secure with a toothpick. 9 - Steam for 20-30 minutes. Here's a wonderful post on Phia Sing from Rambling Spoon. I love the smell of food cooked in banana leaves. The fish looks delicious - thanks for sharing! Hi Sharon - The recipe was very easy to make; and I'm sure it would be fabulous in your talented hands. Hi Kathy - It turned out to be quite good! Hi Chris - I hope you'll try it soon. Hi Rachel - The fish was very moist, yet kept it's form. The hardest part (for me) was wrapping it all...I'm all thumbs it seems. Oh, another way to get more fish into my diet. Looks delicious! Hi Carol - And pretty easy to make...the hardest part for me was getting the banana leaves to "work right". Hi FH - Actually fresh banana leaves are more pliable, but both sohuld be "heated" briefly. Hi Dennis - We used Black Cod for this, but any firm white meat fish should work fine. Pork should work fine....we've done a chicken version which I'll post in the future. Mok Pa (Fish) & Mok Gai (Chicken)...YUM! Mok Moo (Pork) is okay if you use ribs or a fattier section. The paste can also be made in a blender/VitaMix if you're lazy (like me). Also, you can omit cornstarch if you blend in a handful of uncooked sticky rice for the starch. Lastly, if you line a piece of foil w/ the banana leaves, throw everything in the middle and "tent" everything together, you don't have to worry about being all thumbs. ;p Great recipe, Kirk! Hi Pheth - Thanks for the tips....never thought about the aluminum foil thing! Though I believe flavors will be different in a food processor vs a mortar...cutting instead of bruising changes things. I can't wait for the MMM Yoso cookbook! Hi Chris - Nice job...it looks better than what I make! A huge tip - start looking for fresh banana leaves (used for some types of tamales) being sold at reasonable prices at Latin American markets after Thanksgiving. We had the Mok at Tamarind in Luang Prabang about a month ago. Now it's a snowy day in the Midwest and I got the urge to recreate it. Thank you for sharing this! Hi Ginny - Welcome and thanks for commenting! You got us missing Laos now!